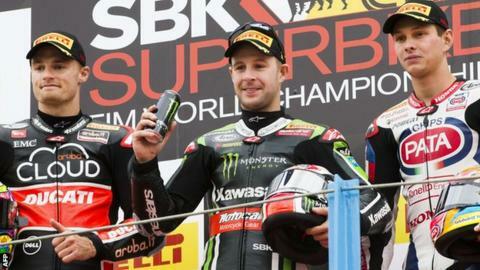 Northern Ireland's Jonathan Rea claimed his second double victory of the season at Assen to move 50 points clear in the World Superbike Championship. Kawasaki's Rea, who has won six of this year's eight races, has 190 points for the season with Aprilia rider Leon Haslam his nearest rival on 140. In the first race Rea, 28, was a second clear of Welshman Chaz Davies with Dutch rider Michael van der Mark third. The second race had an identical 1-2-3 with Haslam fourth both times. Tom Sykes, Rea's Kawasaki Racing team-mate, had started on pole, but faded in each of the races to finish fifth. Rea won both races in Thailand in March and enjoyed single victories in Phillip Island and Aragón. In Sunday's opening race, Rea set a lap record on the penultimate circuit to record his sixth win at Assen and the fifth of his 2015 championship campaign. Pata Honda rider Van der Mark became the first Dutch competitor in the history of the World Superbikes Championship to make the podium when he edged out Haslam. Rea continued his dominance in race two to stay clear of trouble, while Van der Mark again got ahead of Haslam around the penultimate corner to claim another third-place finish. Spanish rider Nico Terol, of Althea Racing, crashed on lap four and was taken to hospital for checks on a wrist fracture. The World Superbikes Championships moves on to Imola next month. Race One: 1 Jonathan Rea (Gbr) Kawasaki 33mins 48.898secs; 2 Chaz Davies (Gbr) Ducati 33:49.996; 3 Michael Van Der Mark (Ned) Honda 33:53.038; 4 Leon Haslam (Gbr) Aprilia 33:53.415; 5 Tom Sykes (Gbr) Kawasaki 33:55.038; 6 Jordi Torres (Spa) Aprilia 33:59.905; 7 Xavier Fores (Spa) Suter 34:03.927; 8 Sylvain Guintoli (Fra) Honda 34:06.616; 9 Nicolas Terol (Spa) Ducati 34:11.604; 10 Leon Camier (Gbr) MV Augusta 34:11.765. Race Two: 1 Jonathan Rea (Gbr) Kawasaki 33mins 51.013secs; 2 Chaz Davies (Gbr) Ducati 33:51.452; 3 Michael Van Der Mark (Ned) Honda 33:53.844; 4 Leon Haslam (Gbr) Aprilia 33:54.005; 5 Tom Sykes (Gbr) Kawasaki 33:57.521; 6 Jordi Torres (Spa) Aprilia 33:58.105; 7 Sylvain Guintoli (Fra) Honda 34:02.203; 8 Xavier Fores (Spa) Suter 34:06.649; 9 Alex Lowes (Gbr) Suzuki 34:07.415; 10 Leon Camier (Gbr) MV Augusta 34:09.518.